Whether or not September brings a nip in the air to your part of the country, this month calls to mind images of apple trees heavy with fruit, apples on the teacher's desk, and apples -- lots of apples -- for making wonderful dishes. The apple is America's favorite fruit. And it is no wonder. They are available year round. There are dozens of varieties, some widely known and nationally distributed, like Red Delicious, and others far less familiar to most of us, such as Patricia, an incomparable eating apple, but limited in production due to its poor keeping qualities. Apples are extremely nutritious, especially with the skin on. A medium-sized apple has about 80 calories, and packs moderate amounts of calcium and iron, along with Vitamins A and B. Raw apples contain high amounts of pectin (apple jelly, for instance, doesn't require the addition of SureJell) and malic acid, which promote good digestion. The skin provides essential dietary fiber (about 3 grams). Studies have revealed that fruit pectins trap and prevent cholesterol from building up in the linings of blood vessel walls, resulting in lowered blood pressure and reduced symptoms of atherosclerosis. "An apple a day" is, I believe, how it goes. Two could be even better. The goodness of apples has inspired cooks for thousands of years, and there is a wealth of cuisine that relies upon them. Grandma's Cookbook contains many recipes with apples at their core (pun intended -- I promise not to do it again); but here we showcase two kinds of Apple Butter, Baked Apples to perfume your kitchen and delight your palate, a moist and delicious Applesauce Gingerbread, Waldorf Salad (a study in contrasts: creamy/crunchy and sweet/tart), a main dish: Pork Tenderloin with Apples, and a bona fide American standby: Grandma's Apple Pie. When cooking with unpeeled apples, always wash them first in order to remove any dirt acquired during shipping and any residual pesticides that may be present. Incidentally, Red and Golden Delicious apples shipped from Washington State, are coated with a harmless vegetable wax to replace the natural wax removed during the washing process. Over 300 apple varieties are grown in the United States; however, only about 20 are produced by the major commercial orchards. These apples are not necessarily chosen for the excellence of their taste but, rather, for their prodigious harvest, their suitability for shipping and long storage, and their disease resistance. But there are plenty of fine varieties that find their way to supermarket produce departments, not to mention Farmers' Markets and the many privately-owned apple orchards that open their gates to the public during the autumn months. It is good to have some specific knowledge about the uses for which certain apples happen to be well suited. The apples listed in the table below are commercially produced and likely to be found in most markets. Remember, too, that apple juice and apple cider can be used interchangeably in recipes. Without peeling or coring the apples, cut them into thick slices and transfer them to a large, non-aluminum pan. Add the apple cider, vinegar, cinnamon sticks, whole and ground cloves and allspice. Bring the mixture to a boil, lower the heat, and simmer for 1 to 1-1/2 hours or until pulpy. Work the apples through a food mill and into another saucepan. Set the saucepan over medium-high heat and continue cooking the mixture until all the liquid has evaporated (this takes between 30 and 50 minutes). Test it: Set a plate in the freezer for a few minutes to chill, then add a drop of the apple butter to the plate. If any liquid seeps out around the edge, the butter isn't ready. Cook for a few minutes longer until apple butter tests okay. Ladle the butter into 4 hot, sterilized pint-size canning jars and attach sterilized tops and screw rims. Allow jars to cool for several hours. Then refrigerate for up to 1 week. OR, process jars for 10 minutes in a hot water bath. Makes 4 pints. Core the apples and cut into quarters. Place in a Dutch oven with the teaspoon of water. Cover and simmer over low heat for 30 minutes or until apples are soft. Turn apples about halfway through the cooking time. Grate the orange and put the orange zest into a measuring cup. Juice the orange into the measuring cup. You should have 1/2 to 3/4 cup altogether. Put the cooked apples through a food mill. Return the apple pulp to the saucepan and stir in the brown sugar and reserved apple juice/zest. Simmer over low heat, stirring frequently, until mixture is thick (about 1-1/2 hours), or pour mixture into a large baking dish and bake, uncovered, in a 350°F oven, stirring occasionally, for 1 hour; reduce heat to 250°F and bake for another 2 to 3 hours until mixture is thick. Remove from heat and ladle into 2 hot, sterilized pint jars, attach sterilized and screw rims. Process jars for 10 minutes in a boiling water bath. Makes 2 pints. 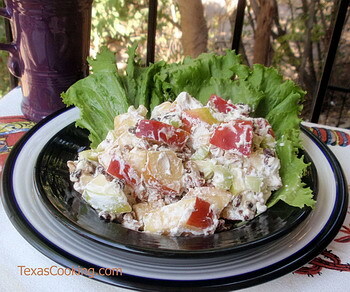 Combine apples, celery, pecans and raisins in a large bowl. Combine the whipping cream, lemon juice and white pepper and whip until mixture is thick and forms soft peaks. Stir cream mixture into apple mixture. Chill before serving. May be served on lettuce leaves, if desired. Spray a baking dish with vegetable cooking spray (or lightly coat with olive oil). Put the tenderloin in the pan. Combine the minced garlic, mustard and spices, and coat tenderloin with mixture. Bake for 10 minutes, basteing with apple juice or wine. Reduce oven temperature to 400°F and bake another 10 minutes. Pour crushed tomatoes evenly over and around tenderloin. Add apple slices to tomatoes. Bake for 20 minutes or until your meat thermometer reaches 170°F. Makes 4 servings. Combine apples and lemon juice in mixing bowl. Combine sugar, brown sugar, flour, cinnamon and nutmeg; mix well. Pour sugar mixture over apples, and stir to coat. Spoon filling into pastry-lined 9-inch pie pan. Dot with butter. Transfer top pastry to top of pie, trimming off excess. Fold edges under to seal, and flute rim. Cut slits, decorative or not, into top pastry for steam to escape. Bake in preheated 450°F oven for 15 minutes. Reduce heat to 350°F, and bake for 45 minutes. Peel apples and core them three-quarters of the way down. Place apples in an 8-inch square greased baking dish. Combine brown sugar, cinnamon, nutmeg, raisins and pecans. Spoon one-fourth of mixture into hollow core of each apple. Top each apple with 1 teaspoon butter. Bring apple juice or cider to a boil, and pour into baking dish. Cover dish and bake for 25 to 35 minutes, basting occasionally with juice. Serve warm. Makes 4 servings. Preheat oven to 350°F. Grease and flour a 9-inch baking dish. Combine melted butter, brown sugar and molasses in bowl. Add eggs, one at a time. Stir in applesauce and beat well. Sift the flour, baking soda, ginger and cinnamon into the batter. Mix thoroughly. Pour into the prepared baking dish, and bake for 35 minutes, or until a toothpick inserted in center comes out clean. Remove from oven and allow to cool for 5 minutes. Turn out onto a wire rack and cool completely. Serve with whipped cream, vanilla ice cream or Brandy Sauce.